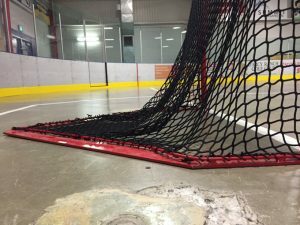 Requirement: As per CLA, effective January 1, 2013, all box lacrosse nets in Canada must meet the Canadian Lacrosse Association (CLA) approved net specification standards and be manufactured by one of an approved list of CLA net manufacturers. See CLA website. 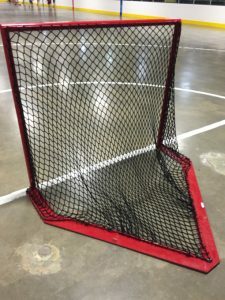 Mesh: In 2015, the RMLL passed a Regulation that all Major nets were to be strung with black mesh. 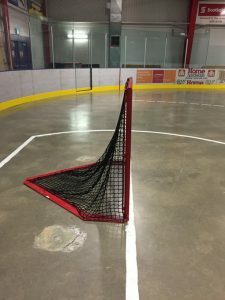 When mesh needed to be replaced, it was to be replaced with black mesh, so all nets should now have black mesh. The white mesh made for situations where Officials may have lost sight of the ball, resulting in missed goals. 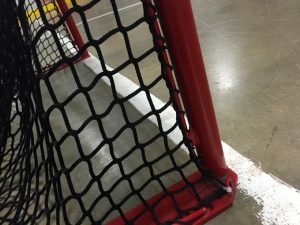 Maintenance of Mesh: It is the Home teams responsibility to ensure the mesh on their nets is in good shape,including after warm-ups, prior to the Officials taking the floor. Although the black mesh is stronger than the white mesh, the black mesh will also develop holes as time goes on. 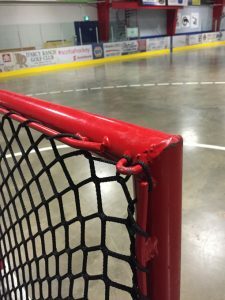 Holes in the mesh can be repaired with shoe laces or string. 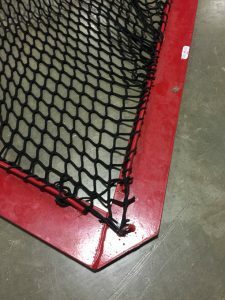 Do not use any kind of wire to fix a hole, or use wire to string the mesh to the goalposts. 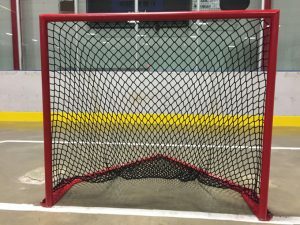 Replacement of Mesh: Depends on how much the nets are used. When too many holes, the mesh must be replaced. Suppliers For Mesh: One supplier for black mesh for 4’X4’6″ frames is Big Hill Services in Coachrane – 1-888-832-2728. 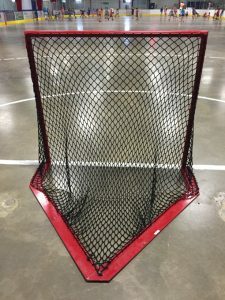 When ordering new mesh make sure mesh is being ordered for 4’X4’6″ frames. If a team owns the Major nets, then they are responsible for the cost. 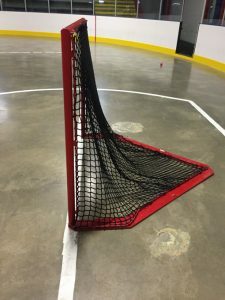 If the arena owns, then just ask the arena to order the black mesh as would be their cost. 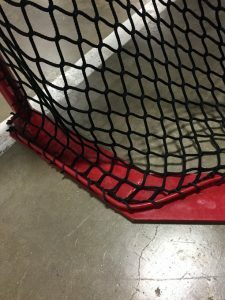 Ensure it is communicated to the arena that the mesh is for 4’X4’6″ frames. Stringing of Mesh: The mesh is not to be drawn taut. 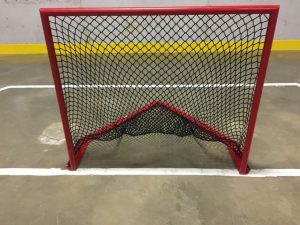 (CLA Box Lacrosse Rule 8 (a) – page 19).If the mesh is the correct size for a 4’X4’6″ frame there will be a lot of slack, which is correct.Please see the photos below of what a 4’X4’6″ frame with correctly strung mesh should look like. Note that the mesh is touching the floor due to the slack, this contact is a good guide for proper stringing. More slack is always better than less.